As I drove to the KELT offices, my eyes kept flickering to the woods on either side of Rt. 1. I was looking for bare ground and dreaming of salamanders. Most of all, we would think “Is tonight the night”? Each year these tiny creatures, frogs and salamanders alike, face a dangerous journey. Not only the unpredictable dance of freeze and thaw, which could leave them stranded on a snow-locked landscape if they emerge too soon, but also a maze of obstacles and threats between each fragile body and its destination. They must return to the small vernal pool where they hatched, in order to mate and lay eggs for the next generation. The pool they are headed for probably isn’t big enough to call a pond, and most likely dries up in late summer, but for the springtime, it is a massive center of activity, and it is the one and only goal of the wood frogs and salamanders that call it home. When a Blue-Spotted salamander emerges from its winter hideaway, he might be almost 500 ft from the pool he needs to reach. That may not sound like much, but imagine being only five inches long and covering that distance when you’re barely a half inch tall. The male salamanders tend to get going first – they need to reach the pool before the females and hopefully before most of the competition shows up. Stakes are high – the earlier they can get there and lay their spermatophores on the bottom of the pool, the more likely that a female will pick their contribution in order to fertilize her eggs. For that reason, the pressure is on to move, and move fast, as soon as the conditions are right. Wood frogs are better travelers, and might be spending the winter over half a mile from their home pool. 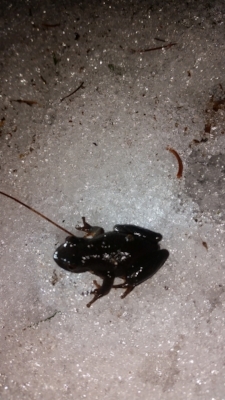 In order to survive the long winters of Maine, wood frogs actually let their bodies freeze, almost completely solid. Right before spending several months as a “frogsicle”, they release glucose (a sugar) into their muscles and organs, which protects their cells from fully freezing. Only the water outside the cells will turn to ice, but to you or I, they would seem hard and lifeless as a rock. This tactic enables them to spend the winter with no food, and to thaw out in spring, re-starting their hearts and getting ready to move within hours. Male and female wood frogs need to reach the vernal pool at the same time, and since the courtship and egg-laying period is brief, there is no such thing as being fashionably late to the party. Since the timing of emergence is so critical, and the migration to the pool so essential, these frogs and salamanders need a certain set of conditions to arrive. You need almost clear ground, since digging yourself out of a deep snowbank just isn’t going to happen when you weigh less than an AA battery. You need temperatures above 40 degrees: any colder, and it’s unlikely that the pool you’re headed for will be unfrozen. Finally, you need a wet night. When you’re an amphibian, dry air is the enemy. So, is tonight the night? Will it be warm enough, wet enough, and can these desperate creatures reach their critical destination? When all of these conditions fall into place at once, the results can be spectacular. Biologists call it “Big Night”, when, on the first rainy night of the spring — when the snow has mostly melted and there’s water in the pools and the temperatures stay above 40 into the night, a mass migration begins. Thousands of frogs and salamanders might be on the move toward the same pool in the same few hours, hopping and crawling and scrambling over snow and ice, around logs and rock ledge, and over dangerous roads. In some communities, volunteers might spend the night as crossing guards for frogs, signaling drivers to slow down or stop where amphibians are migrating in great numbers, to ensure that as many as possible make it to their home pools. Meanwhile, owls, foxes, and other nocturnal predators have a wild night of feasting on these single-minded travelers. If all conditions are right, roads are crossed, predators avoided, the frogs and salamanders will reach the pool and gather into their congress – the biggest party of the woods, and apparently one worth waiting for.